Perhaps as long as man has lived in an urban environment, tuberculosis has lived with him. Although largely forgotten by our own society, until recently TB was a common and dreaded disease, and it still is in the third world. The first effective means employed by medical science to combat the disease was to change the patient’s environment. Hence the TB sanatorium. Summer balcony at Ninette, circa 1940. The history of the sanatorium began as early as the 1850s in Europe and its value was firmly established by Sir Robert W. Phillip of Edinburgh who, in 1887, organized his dispensary to treat tubercular cases and also to keep a close watch on the health of the family members of his patients. The function of the sanatorium was to provide the patient with a clean environment, proper nutrition, rest and exercise. TB has long been a problem for Manitobans, and especially for the Native population. The provincial government established the Sanatorium Board of Manitoba in 1904. After five years of fundraising, the Sanatorium on Pelican Lake, near Ninette, was opened in May of 1910, with a capacity for sixty patientsa capacity which, of necessity, quadrupled in thirteen years. The first Medical Superintendent at Ninette was as famous as the Sanatorium itself. David Alexander Stewart (1874-1937), a Past President of the Manitoba Historical Society and a man of eclectic interests, was a devoted physician who made the eradication of tuberculosis his life’s work. 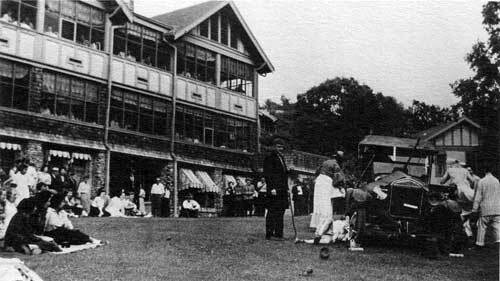 He himself had suffered from the disease and had convalesced at the Trudeau Sanatorium, Sarnac Lake, N.Y., only the year before the institution at Ninette began operation. Since TB is largely a poor man’s disease, procuring funding for the care and treatment of the patients at Ninette was one of Stewart’s major preoccupations. In one way or another all three levels of government were involved. The municipalities for many years paid for patient support through a levy system. In 1939 the province assumed all costs, apart from those incurred in the treatment of veterans and Native people who were the responsibility of federal authorities. 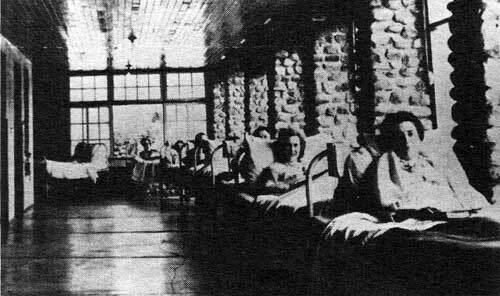 Under Stewart’s guidance the Ninette Sanatorium made unique contributions to the treatment of TB. Ninette offered the first program of in-sanatorium training of medical students. Numerous studies were done and papers written by Stewart and the medical staff there. Patients were encouraged in social and educational activities. Some became laboratory or X-ray technicians while at Ninette. In 1929, changes to the legislation governing the Sanatorium Board left that body in charge of the preventative campaign against TB, and greatly involved the staff at Ninette. The tubercular skin test was twenty-two years old by then and the X-ray machine had already been brought into service. As A. L. Paine, former patient and physician at Ninette, has noted in a recent article in the University of Manitoba Medical Journal, despite the later advent of drug therapy this combination of case finding and the work of the sanatoriums was responsible for the virtual elimination of deaths due to TB in Manitoba in this century. Current generations probably have little idea of the nature and horror of tuberculosis. Loss of energy, loss of weight and a cough are but the mild early signs of TB. In its advanced stages TB can cause bleeding and ulceration in the lungs resulting in pleurisy and the expectoration of blood and other infected material. That is the pulmonary form of the disease. The other and rarer form of the disease is miliary tuberculosis which can attack the lymph nodes, bones and joints, various organs, and the adrenal glands (the latter being Addison’s disease) and can lead to tuberculous meningitis (inflammation of the coverings of the brain and spinal cord). The treatment of pulmonary TB could be much more drastic than isolation in a sanatorium. An infected lung of a patient was often temporarily collapsed and put to rest by the induction of air between the lung and the chest wall (pneumothorax) or even permanently collapsed by the surgical removal of seven or eight ribs (thoracoplasty). Both of these procedures were employed at Ninette beginning in 1934 when the Sanatorium was supplied with an operating room. During the 1940s and ‘50s greatstrides were made in the drug treatment approach to tuberculosis with the drugs streptomycin and isoniazid. By the 1960s TB patients were commonly treated by the administration of these drugs and the surgical removal of ulcerated lung tissue. A vaccine against TB was developed in France in 1921 but won slow acceptance. Studies in the U.S. and Britain, again during the ‘40s and ‘50s, established its effectiveness. In the 1960s and ‘70s more antitubercular drugs were developedethambutol and rifampicinand the home treatment of TB by drug therapy made the sanatorium obsolete. The Sanatorium at Ninette was closed in 1972. Rea, Ed., a short talk delivered at Ninette, 25 September 1982. Paine, A. L., “Manitoba Perspective on Tuberculosis”, University of Manitoba Medical Journal, 52 (1982), pp. 21-37. Long, Esmond Ray, “Tuberculosis”, Encyclopaedia Britannica. XXII, 1973, 298-301.